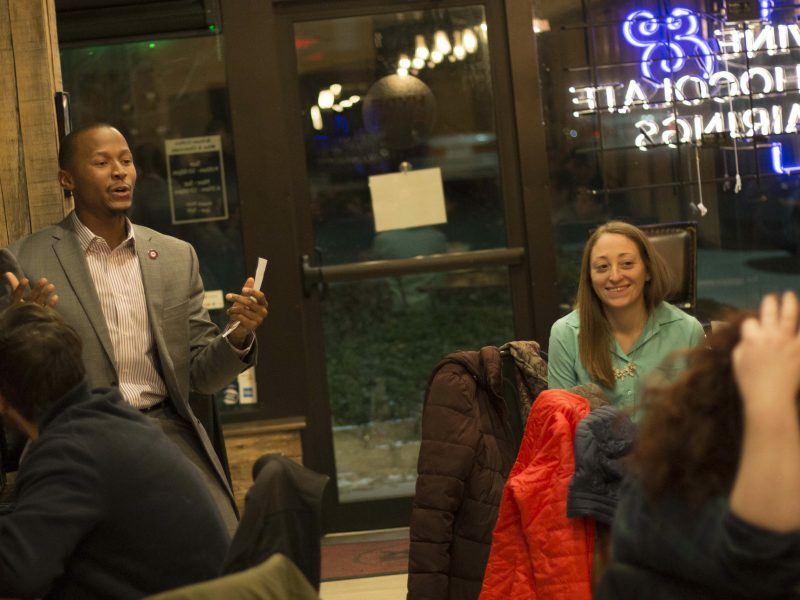 Mario Cannon, President of the Urban League Young Professionals of Greater Southwestern Ohio, leads the discussion at the Jews and Racial Justice Speak Up Speak Easy on February 8. For many people, race can be a difficult topic to discuss. For some, the immediate reaction is to go into panic mode and flee the area anytime someone utters the words “mass incarceration” or “systematic oppression.” The truth is, in 2018 the subject remains crucial, so why not lean into it a bit? In early February, to mark Black History Month, about 30 Jewish young adults did just that at the Speak Up Speak Easy event Jews & Racial Justice, organized by the Jewish Federation of Cincinnati. With the help of the president of the Urban League Young Professionals of Greater Southwestern Ohio, Mario Cannon, this amazing group of bright, open minds learned about the legacy of Jewish participation in racial justice and equity efforts. 1911: Jews were among the first supporters of the Urban League, founded in 1911 to help newly arrived black migrants from the rural South. 1914: Professor Emeritus Joel Spingarn of Columbia University became chairman of the NAACP and was joined on its board by other prominent Jewish leaders including Jacob Schiff, Jacob Billikopf, and Rabbi Stephen Wise. 1960s: As many as 90 percent of the civil rights lawyers in Mississippi were Jewish. 1960s: At least 30 percent of the white volunteers who rode freedom buses to the South, registered blacks, and picketed segregated establishments were Jewish. 1965: Rabbi Abraham Joshua Heschel marched with Martin Luther King Jr. in Selma. Today the work continues. Many Jewish organizations work to bring racial inequity to the forefront, such as Repair the World and the Anti-Defamation League. Locally, the Jewish Community Relations Council (JCRC) is working with other community organizations to create a Coalition Against Hate. The Metropolitan Area Religious Coalition of Cincinnati (MARCC) created an ID card that is bringing undocumented immigrants out of the shadows. A group of faith organizations called the Amos Project helps the most vulnerable in Cincinnati. Also, large numbers of Jews continue to protest, take part in politics, donate to organizations, and engage in activism for racial justice and equity. What drives the extraordinary Jewish presence in racial justice efforts? Some argue it is the concept of tikkun olam (repair the world) or the value of kavod habriyot (respect for others) that motivates Jews. Others say the personal understanding of brutal victimization produces a unique ability to empathize with others who are in danger of experiencing similar treatment. Perhaps it is a combination of these and more. Whatever the motivation, Jews understand that “never again” does not refer only to protecting the Jewish people, but to the unrelenting protection of all. In the wise words of Eli Wiesel: “There may be times when we are powerless to prevent injustice, but there must never be a time when we fail to protest.” Our protests should not be limited to times of historic need—like the civil rights era. Today and every day are times to protest systematic injustice.